I remember, just a little over a year and a half ago, receiving an email on a Saturday morning announcing the launch of a new brand and while the products seemed promising and spirit behind them authentic, nothing could have prepared me for what was toB come : the rise of what I would personally consider as the best independent polish brand. 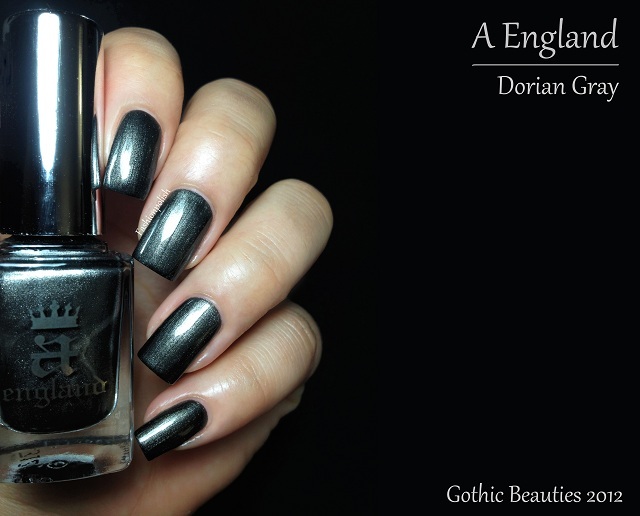 A England's latest collection, The Gothic Beauties, through shimmers and blacks, perfectly impersonates the duality of romantic passion and tragic outcome that characterize the writings of the authors Adina Bodana took inspiration from. 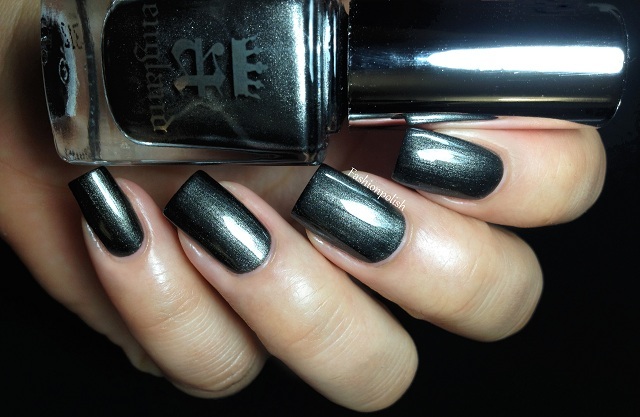 Dorian Gray is a glorious gunmetal shimmer with a strong pewter hue that seems to glow from within while revealing its complexity through darkness on the edges. The perfectly smooth and even formula barely required a second coat and, once again, proved to be no less than A England's very high standard. Two coats over "The Knight" base coat and "The Shield" top coat here. 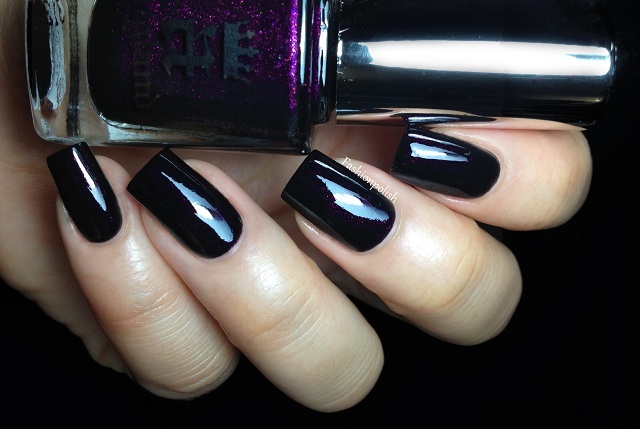 Jane Eyre is a mysterious eggplant shimmer scattered through the blackest black revealing an enigmatic sparkle under direct lighting. While a slight color shift towards gold appears in the bottle, the effect is non existant on the nail but must contribute in the overall glow. 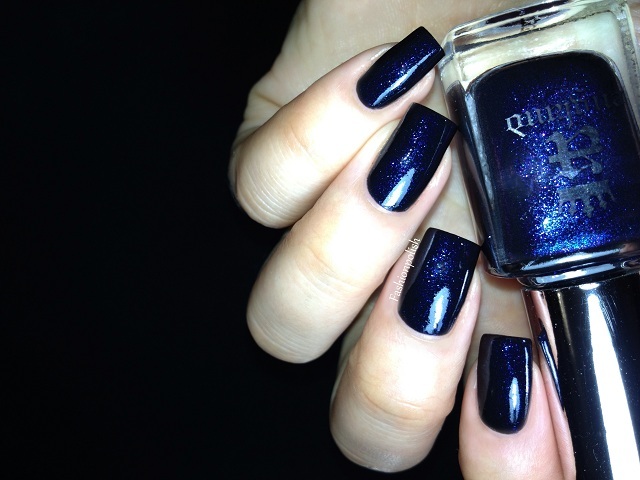 Formula was once again wonderful and opaque in almost one single coat. Two coats over "The Knight" base coat and "The Shield" top coat here. 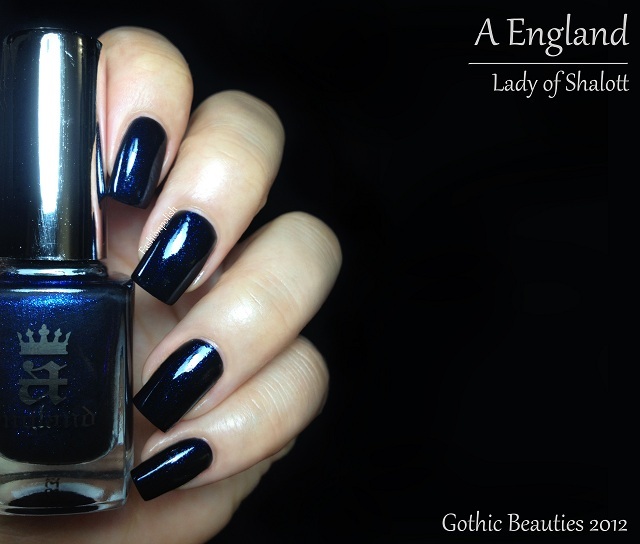 The Lady of Shalott is a precious midnight blue, leaning blurple, shimmer infused in a rich black base. 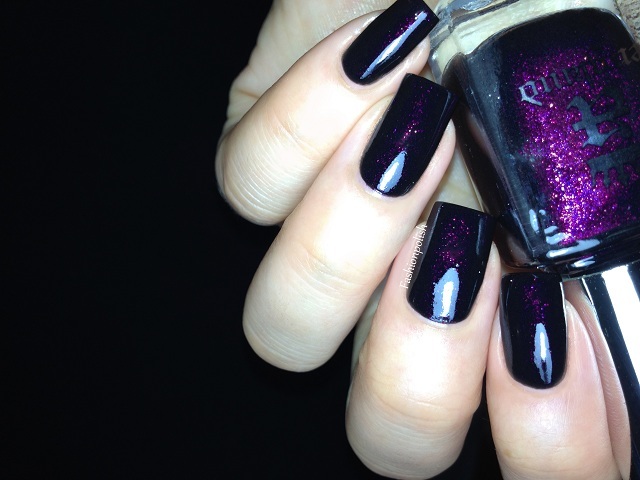 Once again, sparse purple particles and a slight color shift in the bottle do not translate on the nail but the pure perfection of the formula combined with my never-ending crave for blacks allow me to overlook them. Two coats over "The Knight" base coat and "The Shield" top coat here. 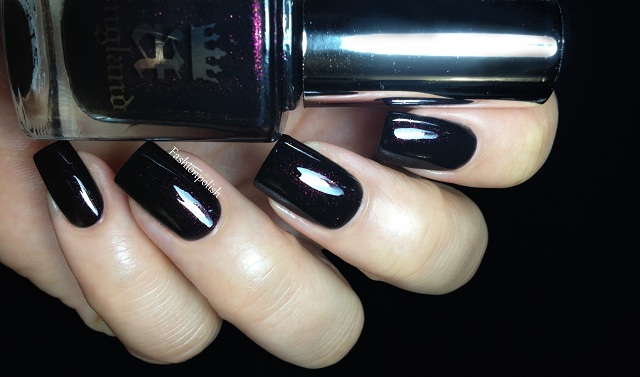 Ophelia is a luxurious warm purple that illuminates the darkest black base. Very similar to Jane Eyre in terms of shimmer and glow, it also shares its high quality formulation and requires no more than two coats to reveal complete coverage and intensity. Two coats over "The Knight" base coat and "The Shield" top coat here. Tess d'Ubervilles is a rich, lustrous, forst green shimmer running running through a black base. 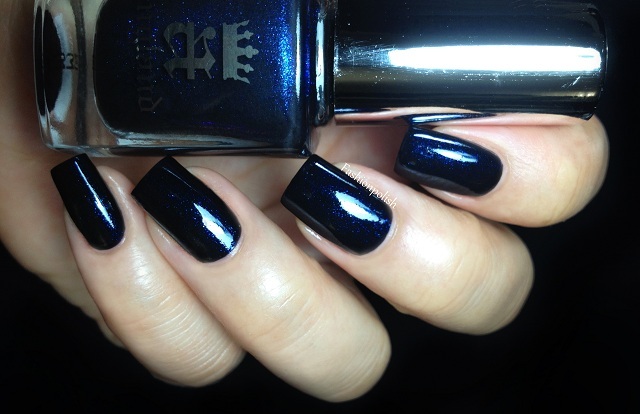 The shimmer in this is somehow bigger than in the other blacks of the collection and manages to peak through the black fairly easily, illuminating the nails with a luminous sparkle. As always, the flawless formula delivers the perfect amount of product. Two coats over "The Knight" base coat and "The Shield" top coat here. I don't think I could express in word the amazement and infatuation I felt when I first laid eyes on these "Gothic Beauties". Dorian Gray truly feels like one of a kind with its dark pewter hue, even in my not so negligible collection of greys. As for the "blacks", be warned, they are extremely dark, almost black under low lighting but for a black lover, they definitely are an object to covet! Retail price : £9 (11ml) each, free shipping worldwide. For more information, please refer to a-england.co.uk or to A England on Twitter or Facebook. These are so beautiful! 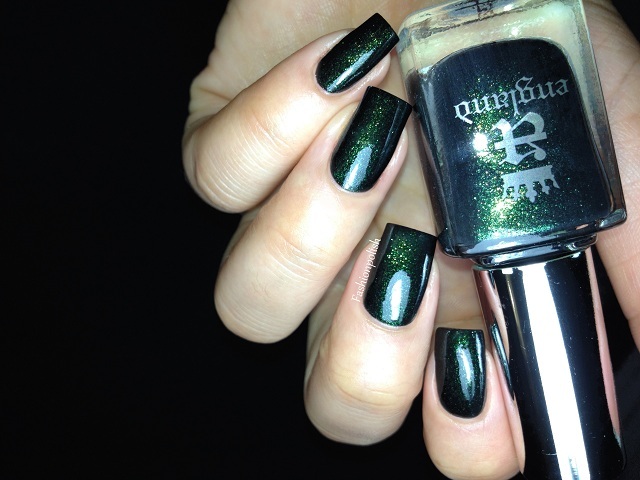 I love the stories and inspiration that Adina pulls from to come up with her polishes. Immaculate swatches - I am completely taken in!!!!! I got also the Chance to pre-order and selected 3 of them. 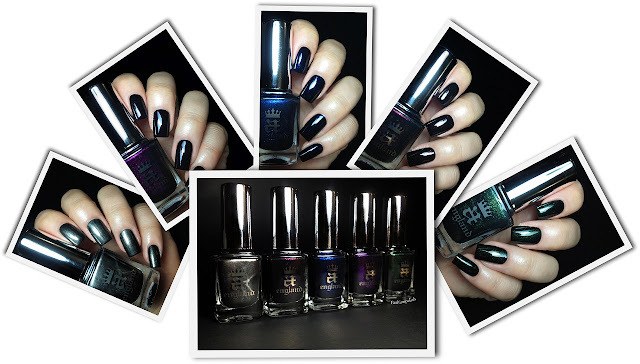 I could wear blackened polish year in and out so for me this collection is perfection!!!!! I bought three of them but I realise now that I probably will buy the rest as well. Sam you've outdone yourself with these very challenging shades! Your swatches are simply sublime. Thank you!!! What an amazing collection, I really like all of them! 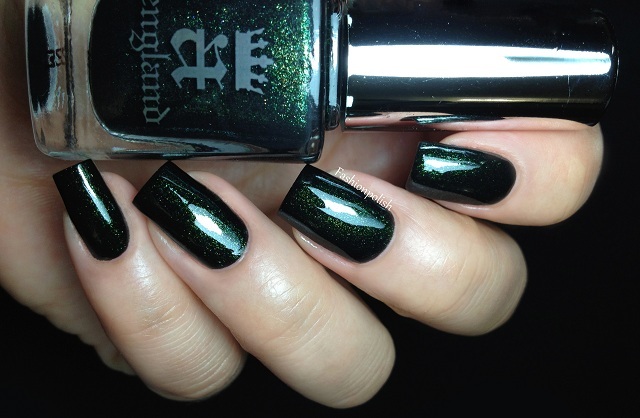 These are so thoroughly gorgeous--and so very elegantly gothic! Maybe I'm crazy, but they all just seem to be black. I really couldn't see all the color you were describing. They are all very dark, basically almost black under low lighting. You will see a shimmer peek through but it's subtle, unless you're under direct lighting of course. They were meant this way and if you're looking for "regular" vampies, you might be disappointed. I absolutely love black nail polish and don't forget that they're inspired from classical Gothic English litterature. These are gorgeous and your photos are amazing. I also am a sucker for a literary reference. Chic Lucky! Very nice gloss! Still, unless I had a flash going off around my fingertips, so that I could witness the lovely glintings you captured, I'll be taking a pass on this collection. OMG these are gorgeous! I want them all! I keep going back and forth with these. 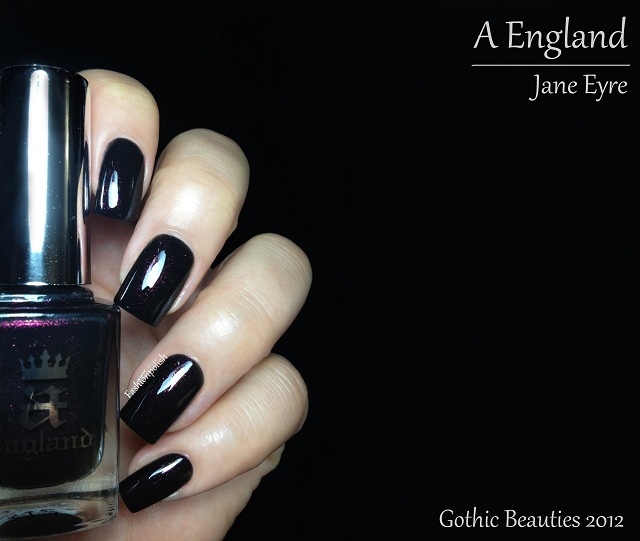 I have several A-England polishes from the other two collections. The Gothic Beauties appear to be very pretty but, only under very bright light. Unfortunately, most time wouldn't be spent under that lighting. I don't know if I can justify the cost for a polish(es) that doesn't seem as exciting/pretty as those from the earlier collections. Lady of Shalott and Ophelia are my favorites!